On Ubuntu 14.10, I'm connecting to the same VPN service using either OpenConnect (through the network-manager-openconnect(-gnome) packages or the Cisco AnyConnect Client. Using the AnyConnect client, I have had no problems, while OpenConnect gives me strange connection issues (but only with some programs). How can I achieve the same using OpenConnect? In Network Manager, under "Edit connection", there is an "IPv6 settings" tab, but the only relevant setting seems to be "Method" with the options "Ignore", "Automatic (VPN)" and "Automatic (VPN) addresses only" – I don't know what the difference between them is, but none of them seem to do what I want. Is the --disable-ipv6 flag that can be given to openconnect related? How would one use that in Network Manager? Note: I have seen this question about disabling IPv6 with OpenVPN, but the answer given there is unsatisfactory – I don't want to manually and globally enable/disable IPv6 every time I connect to or disconnect from the VPN. You'll need to change your default route. Be sure to change the 192.168.1.254 with whatever IP your gateway is for your VPN. I prefer using OpenConnect vs AnyConnect. Not the answer you're looking for? Browse other questions tagged networking network-manager vpn cisco or ask your own question. How to disable IPv6 when connecting to an OpenVPN server using Network Manager on a dual-stack system? 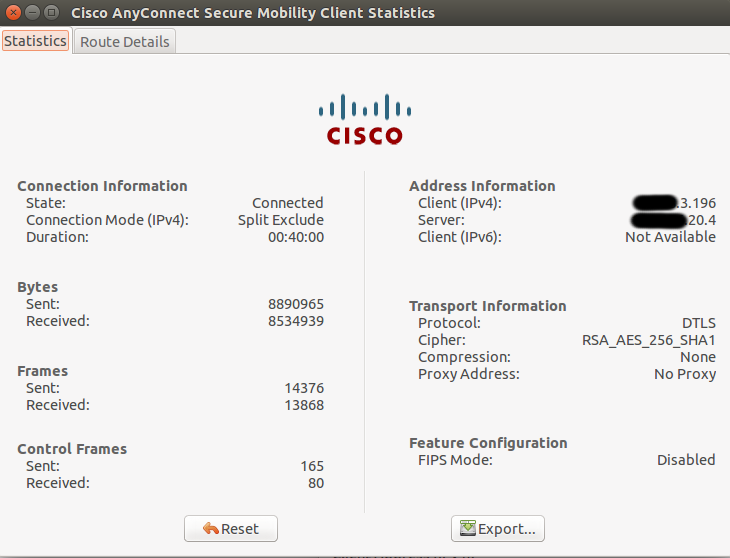 How to fix name resolution issue after an update to Cisco AnyConnect Secure Mobility Client on an Ubuntu?